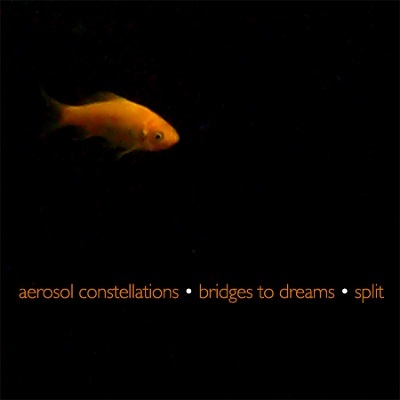 There is a wonderful connection between ‘Aerosol Constellations’ and ‘Bridges to Dreams’ on this split 3″ CDr. It’s a sleepy deployment of sounds that spreads hands between a bittersweet lullaby and magical, cinematic sonic landscapes. The cover photo shows a bright goldfish, shining over an empty, black space. At some points on this two tracks split, there are moments when you can feel just that. Both ‘Aerosol Constellations’ and ‘Bridges to dreams’ point their original music like warm beacons of slow light through the dark, which seems to be a fitting medium for this music to spread through. I don’t know either of these projects, and I don’t know how a complete album of either one of them would sound, but together they form a brief, small world of wonder that it would be a shame to miss. If you know [walnut + locust] by now, you know that something good lies inside the data lines of this CDr.